Every single man on a motorcycle in the Dominican Republic is now a suspected insurgent, as President Danilo Medina instructed the Ministry of Defense and the National Police execute his new plan for "citizen safety." Lieutenant General Máximo William Muñoz Delgado, the country's defense minister, told Diario Libre, a large circulation daily in the Caribbean, that his men would bring "peace and tranquility to the state," while promising to set up checkpoints throughout the country, with the objective of stopping motorists and warrantlessly checking their bags and possessions. Although the government announced that deployment of soldiers in the Dominican Republic, which occupies the island of Hispaniola with Haiti, was part of a new citizen safety plan, the tension was still palpable outside of the country's electoral offices even today, almost one month after the elections which saw Mr. Medina gain re-election with an unprecedented majority. Mr. Medina's victory was marred by the resignation of 3,000 electoral technicians just before the vote, and has now been further tarnished as the entire opposition has come together (Christian fundamentalist, Marxists, and ultra-nationalists, etc.) to present evidence to the Organization of American States that the fraud was systemic and massive. Acento, the country's main liberal daily, reported that the document proving fraud will be handed to the representative of each country in the Americas outlining the illegitimacy of many elected officials. 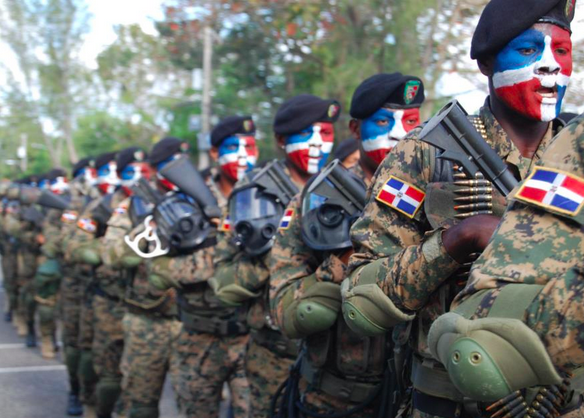 This year, coincidentally, the Dominican Republic is in preparations to host the 46th OAS summit, and this could lead to mass-scale violence as visiting dignitaries are shielded from angry members of the opposition. The potential for violence is high, and the government seems to have hedged its bets on mass protests continuing to be a problem.